Market leading Planitherm energy saving window glass uses advanced coatings to keep in the warmth whilst capturing the heat from natural daylight meaning your home will be warmer and heating bills lower compared to standard double glazed windows. By insisting on Planitherm when speaking to your installer you can be confident you will reduce your energy bills. For about the same costs as standard glazed, less energy efficient windows, your installer will be able to provide you with A rated windows using the frame of your choice. We have devised a selection of glazing options to help you find the right glazing configuration for your home and lifestyle requirements. These provide you with the ultimate choice when making such an important purchase. A sk your installer for Planitherm if you are planning to replace your existing single or double glazed windows, and want the best possible solution to saving energy. ** 22% savings are typical but each home will vary. Example is for a semi-detached, 3 bedroom UK home saving £179 per annum for an A rated window (source Glass & Glazing Federation and Energy Saving Trust) with an annual gas bill of £800 (source: Department of Energy and Climate Change). At Saint-Gobain Glass we are always looking for ways to make it easier for homeowners to chose the right windows for their home and believe that by providing a range of Glazing Options packs specifically designed to meet individual lifestyle needs you can make an informed choice. Our Glazing Options packs provide a whole range of additional benefits including increased energy savings, winter comfort, daylight comfort, security, acoustic comfort, UV reduction and easy maintenance. 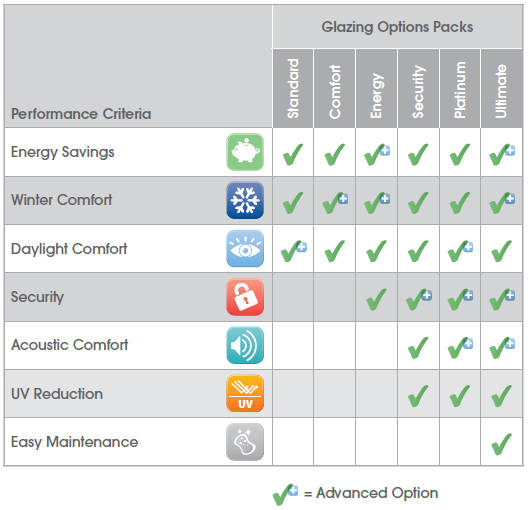 The table below shows you the key performance attributes for each of our Glazing Options packs. Double glazed windows containing PLANITHERM can easily achieve a “B” window energy rating above the minimum required “C” and it is much easier to reach an “A+” rating for superior energy efficiency.